Episode 9: DCC Gen Con, Baby! The Spellburners are finally recovered from Gen Con 2013, but our pain is your gain, because this week we’re discussing all the dungeon crawling news, noteworthy events, and even how we met Hugh the Barbarian, all at this years’ Gen Con. 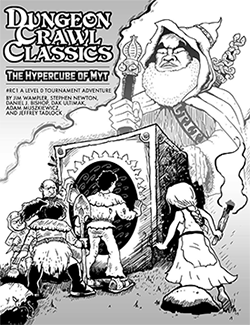 Plus we talk about Goodman Game’s upcoming slate of DCC RPG adventures, including a few written by one of our own – Judge Jobe! Glad to see you back! It sounds like GenCon was a blast! Back to your Spellburnin’ best! Great news about the monster alphabet. Bought dungeon alphabet on your recommendation and think it’s brilliant. You guys have definitely upped my gaming budget! Great episode. GenCon sounds amazing, wish I could have been a part of it. I’m interested in an RPing episode too, and would like to know exactly how you guys do it. Can you point me to the Save or Die episode where this is talked about? The Save or Die episode was great but it barely touched the tip of the subject, I think. Both podcasts are great and am now listening to both but not at the same time. First, for your long distance listener wanting to participate in the World Tour but lacking conventions I believe games run at stores can also qualify. Sounds like it counts as long as it’s open to the public and advertised/posted somewhere. Second, (though I’m sure you’ve already either looked up or been informed) the movie with the ‘rocket sword’ was The Sword and the Sorcerer. That movie played in the background nearly nonstop one summer as my friend Peter and I made dungeon after dungeon for the other to suffer countless character deaths in as we cut our teeth on AD&D (good times). Take care and carry on! Looking forward to the next episode. “I sat everything on fire, and I ran and hid.” Best quote ever! Another great episode guys. Thanks for the stroll, gentlemen. That was one hell of a weekend.